finally, i feel like i've got something cool to show you guys. i've had this project limping along beside me for quite some time, but most of the work has been done over the last couple of months. it started with a book. i was browsing through powell's one day and i found a little halloween book by illustrator ryan heshka. the book is called ABC spook show. if you have not seen this book yet, i recommend it highly. 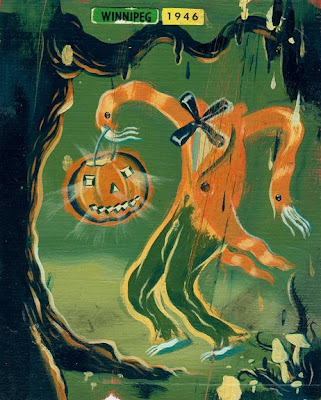 what strikes me most about heshka's work here is that he seems to really nail the "classic halloween" vibe that i love so much, and makes it feel fresh, new, and completely his own. 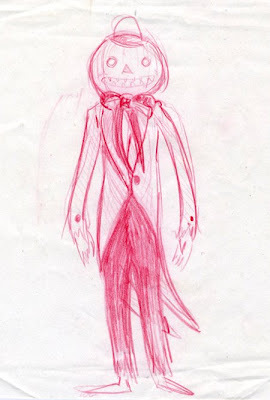 as a child i really loved the headless horseman and his flaming jack o' lantern, so i kind of flipped when i saw the j is for jack o' lantern illustration in the book. that was the spark. below is a scan of the image, posted with permission from the artist (thanks ryan!). isn't it great? i loved this image, but i didn't really know what i was going to do about it. so i guess i decided to... borrow from him a bit. i wanted to try and make a quick and dirty puppet and put together a little halloween "card" video to send to all of my friends, possibly as an invitation to a halloween or birthday party (my birthday is in october). i scribbled a little drawing of my version of the character and set to work... but you know, its hard to do stuff like that and keep up with the day job, so the puppet never really progressed much past that point until very recently. here is my chicken scratch. i'm extremely fortunate to have a circle of friends to call upon when i (frequently) realize my shortcomings, and i gratefully acknowledge that i had a good deal of help realizing this puppet. the first to help was the lovely and talented vera brosgol who did me a gigantic favor by drawing a full turnaround based on the picture above. i used the turnaround to help figure out the scale of the puppet, and to assist with making some color choices. i went fabric shopping with some vague ideas in mind, and ended up buying enough fabric to make several variations. i scanned some swatches and played around in the computer until i came up with some schemes i liked. i wound up with about 4 options that i thought were pretty strong, and in the end i think any of them would have looked great. whatever. i am super happy with the one i went with. i'm pretty sure the next step was making the head, which was sculpted in... uh... hmm. either magic sculp or aves apoxie sculpt, i really can't remember. one of the two for sure. at some point while i was out of town earlier this year shea bordo made me a nice 2 part GI 1110 mold and cast me up some heads to play around with. more recently i painted the head with our new airbrush setup at the studio. i used acrylic paints and ink washes followed by a nice protective layer of crystal clear and dulled the finish back down with krylon matte finish 1311. i'm really happy with the way the color turned out. 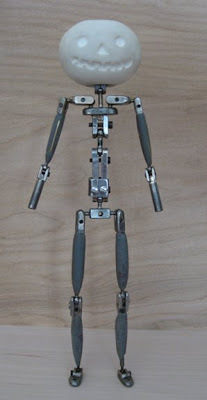 the armature is really straightforward. nothing fancy. i gave him an extra body joint just in case he ever feels like doing some acrobatics or breakdancing some time down the road. 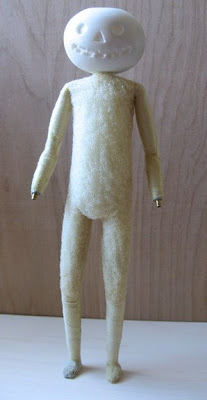 this was always going to be a costumed puppet, so i had never planned to do a sculpt for the body. i built him up as a simple clip foam body glued together with barge. i topped off the arms and legs with some foam athletic wrap to make the surface a bit more uniform. 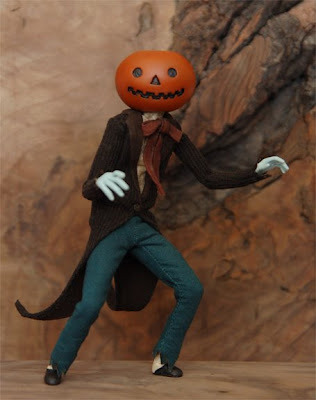 his little shoes and spats are made out of ladies glove leather. my favorite part of this puppet is the costume, which was made by the lovely and talented (again!) paloma soledad. paloma designed costumes for several of the characters i worked on during coraline, perhaps most notably miss forcible in her beautiful corset. earlier in the design phase she walked me through a lot of the particulars of puppet costuming at a time when i was still planning on sewing the costume myself. yeah right. maybe next time. it became painfully obvious that it would take me 10 times as long to make something 100 times inferior to what she could do, so i did the smart thing and hired a professional. i hope the next time you see this little dude he will be moving around, or at very least hanging out in a swamp or something. WOW. nice pro puppet. the body build up looks really smooth. Did u use a dremel to get it like that? Or careful work with scissors? how much did the wardrobe cost ya? This guy is finely crafted. Nice work. This is really awesome, Juice. This looks great. Nice work Jeremy! build up was just trimmed with scissors, no fancy stuff. the lower legs and the arms were wrapped with athletic foam bandage stuff and barged flush. wardrobe cost? it was a very reasonable price for the quality i required. i am very pleased with the job. paloma does fantastic work, and i am sure she would be able to give you an accurate quote if you are interested in hiring her. Looks great Jeremy! He looks like he could be 60-70 years old- which I think is just what you were going for. Now make him move! 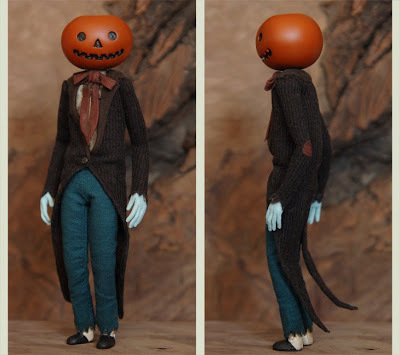 Nice looking work Jeremy, the whole thing looks great armature to the costume. Does he get a wire handle on his head or did you decide to leave it off. This looks so freakin' awesome! Well done! That is a build-up puppet??! Looks cast and dressed. Very nice work. Wow J, that is AWESOME!!!! 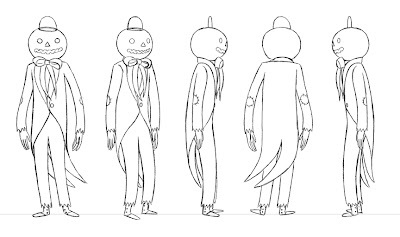 Really looking forward to seeing him come alive!!! Hey, I"m gonna send you a Flickrmail... you might want to post him on a cool Flickr group for stopmo puppet construction. I joined recently, and I"m really digging it!! I'll still send an invite through Flickrmail though. Once you're in there you'll see some other similar Flickr groups... great way to meet other stopmoes. 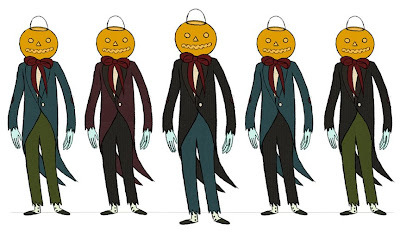 after seeing his work in person, it would have been awesome to have seen the original pumpkin illustration/painting with the glossy finish. ryan heshka. pretty awesome artist/guy.